Thank you for your interest in volunteering. Below you will find answers to our most commonly asked questions. We hope this will give you the information you need and help you decide to volunteer with us! Please check with our volunteer coordinator, Gerald Casey at Phone (312) 429-6702 or email him at caseyg@pgm.org, to determine what areas have the highest need. Groups up to 15 can help serve a meal in the kitchen. Larger groups may volunteer for special events. 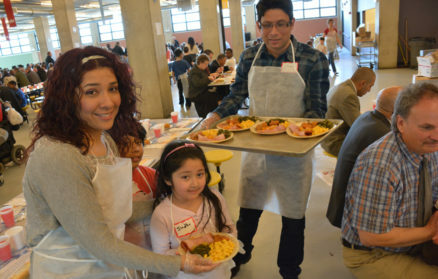 Pacific Garden Mission provides volunteer opportunities for individuals of all ages. Special kitchen assignments are offered but are limited by availability for children under 12. Please inform the Volunteer Department in advance if you have children in your group. Groups of children or teenagers under 16 years old must be accompanied by an adult chaperone who is over 21. Yes, we have volunteer opportunities available six days a week, from 6 a.m. to 8 p.m. The only day we do not accept volunteers is Sundays. Yes. Food service volunteers MUST wear closed-toe and closed-heel shoes, and long pants (no capris or cropped pants). Wear clothes you are comfortable in and wouldn’t mind getting a little dirty! Do I need to have any volunteer experience? No, we take volunteers from all different backgrounds. No experience is necessary. Just a willingness to serve. Do you have a question you didn’t see answered here? Contact us by clicking on this email link and we will be happy to answer all your questions.